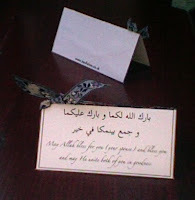 Bless a newlywed couple by presenting them and all the guests with a ready-to-read and personalised marriage du`a place-card. Here's how I make mine. A certain someone asked me to help with creating place-cards for a Muslim wedding that included the du`a for newlywed couples. I usually take a du`a book with me for events and outings; at a wedding this isn't practical for everyone, plus, not every Muslim knows the 'standard' marriage du`a. Everyone invited thus the gets the chance to bless the marriage and learns a new du`a. May Allah bless for you (your spouse) and bless you and may He unite both of you in goodness. Converting this text into a Microsoft word document can be done but it takes a few impatient installing and checklist ticking processes. You could go ahead and copy the above text into any other text editor though, but without the extensive formatting options available in Microsoft's software. Thank Allah, I have the Mac-rooh. I've copied the text into a .jpg file (image), inserted this image into a ms word doc. and played with it to create a table place-card for attendees to read. 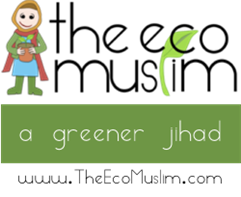 This is the dua text as an image (right click, copy/ download). ...Like this. Now edit the fonts/ typefaces. Add colour, a border and personalise it with the bride and groom's names. 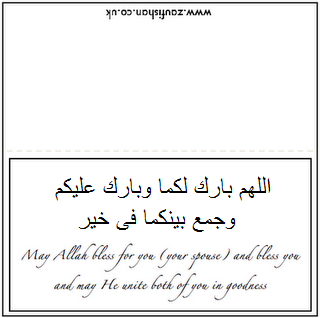 The du`a image and translation have been further edited into a place-card approximately 10x10cm; a dashed line indicates the crease for a sharp fold. Right click and download the image below to print your own ready-made place-cards courtesy of Zaufishan.co.uk. And here's one I made earlier... along with 300 others. The cards also work better printed onto stiff paper. Enlarge your cards for bigger impact as centre pieces or minaturise them to hang as decorations. Attach an embellishment such as ribbon that colour-coordinates to the wedding (women do that). Hang with pegs, glue onto flower stems for a quirky twist or pop them into favour bags when guests arrive. the arabic version is spelt wrong! 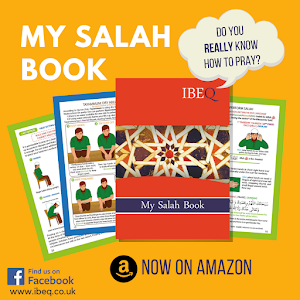 The Arabic du`a you provided 'Allah-humma' roughly translates as "Oh Allah". It's a calling out to God. The du`a above begins "Barak'Allahu" - "Allah bless (you)" and the marriage is implied. Both are correct. Masha'Allah, whatever God wishes. marry remember to offer a Dua to be blessed with Allah's blessings.